It really is quite strange, when I think about it, reading blogs and communicating through emails to all my conductive friends and acquaintances around the world. Of course it is lovely to get to know so many people in the world of cyberspace without coming face to face with them and, unless we use Skype, never even hearing the sound of each other’s voices or knowing what the other looks like. Meeting people and keeping in touch like this would never have been possible before even only ten years ago. The World Wide Web was actually “invented” in 1989, in the same year that I began my conductive journey, but in those early days, even in 1993 when I moved to Germany, very few people were using it. Communication with my friends was difficult, scattered as they were from one corner of the world to another. That has all changed so much. Whatever what would we do without it now? My life would be far less rich than it is, that’s for sure, and because of the contacts that I make or keep through having access to the Internet that my already very busy summer will be even busier. Yet another one of the advantages of not closing down for the summer! I shall be at home! Ready to receive the visitors who have already booked their spots. I will be working most of the summer and people who are taking summer holidays will be passing through, dropping by to look at my groups at work, to say hello, to pick my brains in person and to see something of the beautiful city of Nürnberg. These visitors are not all just cyberspace friends, some I have met in “reality” but I have kept in touch with them over the years through “virtual” means. In some countries the summer holidays have begun and the first of my visitors arrived on Sunday after a very long, traffic-jam-filled journey from England. 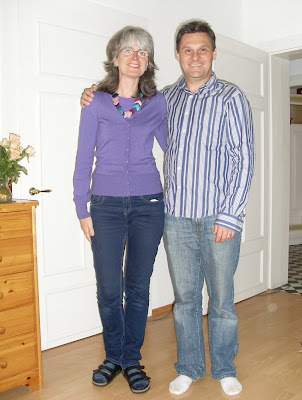 The picture above is of Szögeczki Laci and me in my flat in Nürnberg this last weekend. Laci and I have know each other for about twelve years now, I don’t really remember when we first met. He is one of the conductors whom I met in Munich at the early conductors' meetings before the German association for conductors was even formed. He worked then at Pfennigparade in Munichand I was in Nürnberg. He is one of the first conductors who accepted me as not being different, even though I was. At that time I was the only person at these conductors' meetings who wasn’t Hungarian. I was a non-Hungarian conductor, at that time still a very rare commodity indeed! Laci and I talked a lot even then but that was nothing to compare with how we talked last Sunday. Non-stop. We have always talked in English or Hungarian, even in the early years, never in German. Laci and his family were travelling through Nürnberg by car, on their way to Pécs, Hungary, at the beginning of their summer break. I would actually have loved to have travelled on with them, as Pécs is what I consider to be, after Budapest, the loveliest city in Hungary. The architecture is lovely, the colours of the buildings are lovely, soft yellows, oranges and pinks, and many are adorned with pretty balconies (erkélyek). There are beautiful theatres and churches, and interesting museums and galleries by the score, including one showing works of my favourite Hungarian artist, Csontvary. Laci and his wife are both conductors, both working at a well established, parent-initiative conductive centre in England, where they work in a team with four other conductors. It was interesting to discuss with them how Conductive Education or upbringing is offered in their place of work in England and in those I work in here in Germany. It was a pleasure to invite them into my home, to show them a little bit of the area around where I live, (especially the children’s playground and the tram-lines, a great hit with their 2 1/2 year old son), and a couple of the local cafés. It was so lovely to meet my friends, to offer them a bit of relaxation on their way from the Heart of England to southern Hungary. A stop-over on their long journey between from one of my homelands to the other, via the place where I live. Now that Laci and family have left, my flat it is feeling a little empty. I have never had that many people in my flat at one time before! I am missing their company. I really enjoyed the opportunity to be with them in person, to hear their voices, drink a beer or two together and chat into the early hours of the morning! You can't do all that that in a blog posting!